Heat oven to 350°F (325°F for dark or nonstick pan). Grease and lightly flour bottom and side of 10-inch angel food (tube) cake pan or 12-cup fluted tube cake pan, or spray with baking spray with flour (do not use cooking spray). In large bowl, beat cake mix, dry pudding mix, water, butter, eggs and 2 to 3 teaspoons rum extract with electric mixer on low speed 30 seconds, then on medium speed 2 minutes. Spread in pan. In small microwavable bowl, microwave frosting uncovered on Medium (50%) 15 seconds. Stir in 1/2 teaspoon rum extract. Spread over top of cake, allowing some to drizzle down side. Sprinkle with pecans. Store loosely covered. For best results, do not use sugar-free pudding mix. 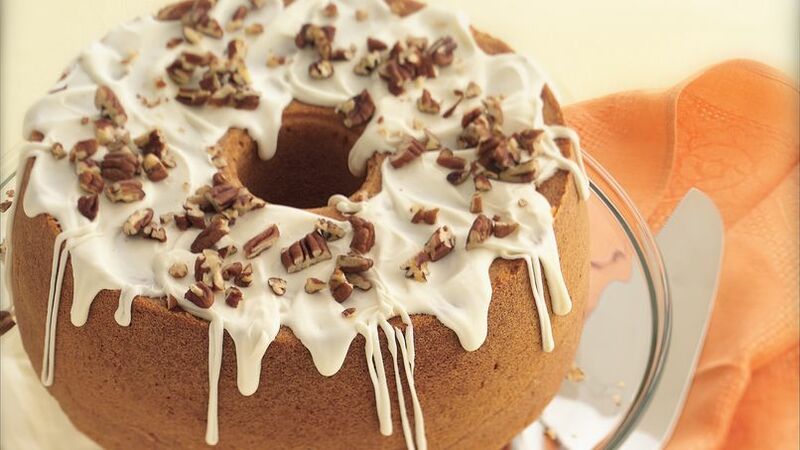 Ready-to-spread frosting flavored with rum extract and crunchy pecans makes this cake a good nonalcoholic version of rum cake.